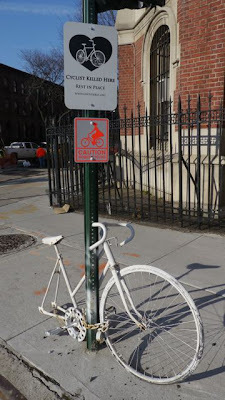 Ghost Bikes can be found all over Brooklyn, New York City and most of the world. They are memorials to bicyclists who have been killed on the street. 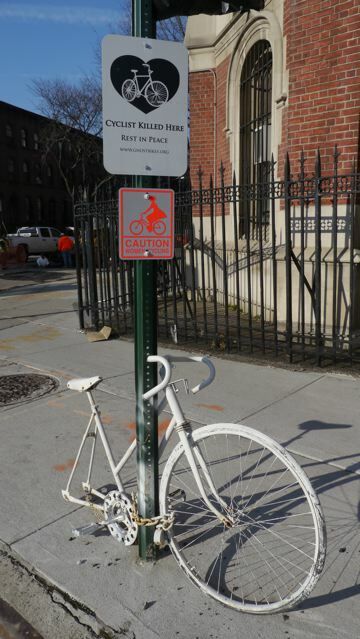 A bike painted white is locked to a permanent fixture at the nearest location to the actual crash - oftentimes there is a plague with the cyclist's name. It is a somber reminder of that individual person who died and a call to make our streets safer for everyone. 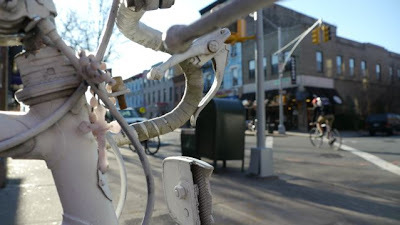 Ghost Bikes - In A Brooklyn Minute (Week 85) from Luci Westphal on Vimeo. The video features three Brooklyn Ghost Bikes in memorial to Jasmine Herron, Elizabeth Padilla and Julian Miller. May they rest in peace. 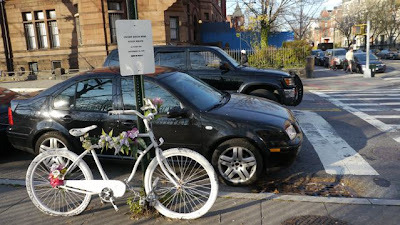 The 2005 accident that killed Elizabeth Padilla sparked the arts collective Visual Resistance to make Ghost Bikes in New York City. The project was inspired by similar efforts in Pittsburgh and St. Louis, where the first bike was created in 2003. By now 460 Ghost Bikes have been created in over 170 towns, including Berlin. On the website GhostBikes.org (set up by the NYC Street Memorial Project) you can find a list and a map with all the bikes - although I have to say that several listed on the map were not actually there (anymore?). Bike riding has been part of my life since I was 4 years old. One of my happiest memories is getting my red bicycle for my 4th birthday. I grew up in the flat countryside of Northern Germany where biking is quite safe and a beautiful mode of transportation and relaxation at the same time. It's a great way to commute and explore. You move fast enough to get to places - but slow enough to feel connected to the geography you travel through. I especially loved getting to know Berlin on my "Dutch Bike". Now back in Brooklyn I'm reminded every day how dangerous it is. The bike lanes (if there even are any) are on the streets, mostly just marked by a white line which is often ignored by car and truck drivers. NYC has an atmosphere where everyone seems in a hurry and everyone seems to look out just for themselves. But we can't live like that. We have to look out for one another and we have to make the streets safer for cyclists, pedestrians and also motorcyclists and drivers. The haunting song featured in this video is "The Same Way - Part 3" by the Italian band Spleenveil.